Sometimes we just need CAPTCHA, that's a sad fact. Today we will learn how to integrate with reCAPTCHA. Because the topic itself isn't particularly interesting and advanced, we will overengineer a bit (?) by using Spring Integration to handle low-level details. The decision to use reCAPTCHA by Google was dictated by two factors: (1) it is a moderately good CAPTCHA implementation with decent images with built-in support for visually impaired people and (2) outsourcing CAPTCHA allows us to remain stateless on the server side. Not to mention we help in digitalizing books. The second reason is actually quite important. 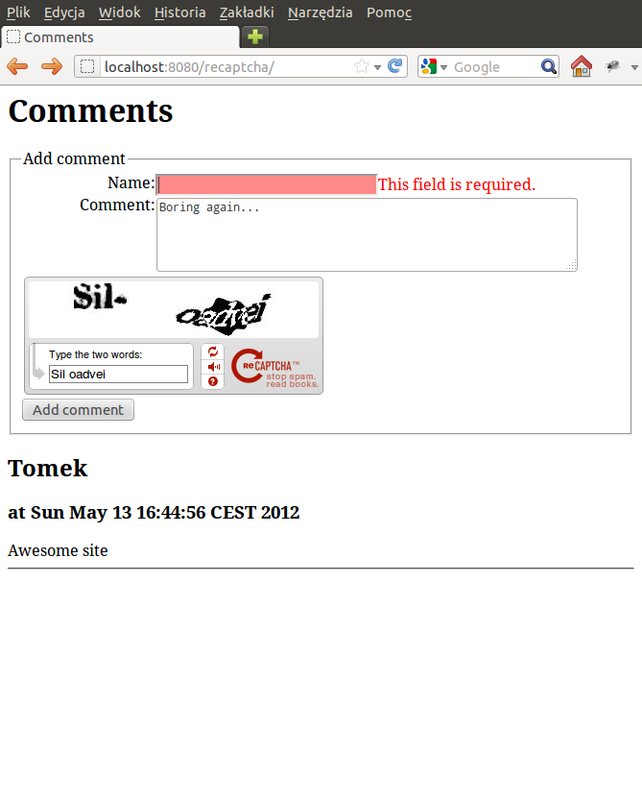 Typically you have to generate CAPTCHA on the server side and store the expected result e.g. in user session. When the response comes back you compare expected and entered CAPTCHA solution. Sometimes we don't want to store any state on the server side, not to mention implementing CAPTCHA isn't particularly rewarding task. So it is nice to have something ready-made and acceptable. The full source code is as always available, we are starting from a simple Spring MVC web application without any CAPTCHA. reCAPTCHA is free but requires registration, so the first step is to sing-up and generate your public/private keys and fill-in app.properties configuration file in our sample project. @BeanProperty var recaptchaChallenge = ""
@BeanProperty var recaptchaResponse = ""
@BeanProperty var name = ""
@BeanProperty var contents = ""
The whole CommentsController.scala is not that relevant. But the result is! In our case we will describe a message flow from HttpClientReCaptchaVerifier Java interface/Scala trait to the reCAPTCHA server and back. On the way the ReCaptchaSecured object must be translated into HTTP request and the HTTP response should be translated into meaningful result, returned transparently from the interface. Despite the amount of XML, the overall message flow is quite simple. First we define gateway, which is a bridge between Java interface and Spring Integration message flow. The argument of ReCaptchaVerifier.validate() later becomes a message that is sent to reCaptchaSecuredForm channel. From that channel ReCaptchaSecured object is passed to a ReCaptchaFormToHttpRequest transformer. The purpose of the transformer is two translate from ReCaptchaSecured object to Java map representing a set of key-value pairs. 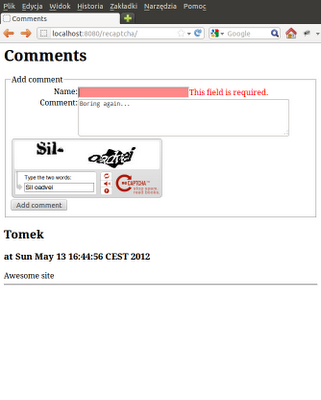 Later this map is passed (through reCaptchaGoogleServerRequest channel) to http:outbound-gateway. The responsibility of this component is to translate previously created map into an HTTP request and send it to specified address. When the response comes back, it is sent to reCaptchaGoogleServerResponse channel. There ReCaptchaServerResponseToResult transformer takes action, translating HTTP response to business result (boolean). Finally the transformer result is routed back to the gateway. Everything happens synchronously by default so we can still use simple Java interface for reCAPTCHA validation. Believe it or not, this all works. We no longer use HttpClient (guess everything is better compared to HttpClient 4 API...) and instead of one "huge" class we have a set of smaller, focused, easy to test classes. The framework handles wiring up and the low-level details. Wonderful? Architect's Dream or Developer's Nightmare? Let me summarize our efforts by quoting the conclusions from the presentation above: balance architectural benefits with development effectiveness. Spring Integration is capable of receiving data from various heterogeneous sources like JMS, relational database or even FTP, aggregating, splitting, parsing and filtering messages in multiple ways and finally sending them further with the most exotic protocols. Coding all this by hand is a really tedious and error-prone task. On the other hand sometimes we just don't need all the fanciness and getting our hands dirty (e.g. by doing a manual HTTP request and parsing the response) is much simpler and easier to understand. Before you blindly base your whole architecture either on very high-level abstractions or on hand-coded low-level procedures: think about the consequences and balance. No solution fits all problems. Which version of reCAPTCHA integration do you find better?